Found 2 file extension associations related to Microsoft Write and 1 file format developed specifically for use with Microsoft Write. Windows Write is a simple word processor that came with Microsoft Windows 1.0, Windows 2.0, and the Windows 3.x series. Throughout its lifespan it has been minimally updated, and is comparable to early versions of MacWrite. 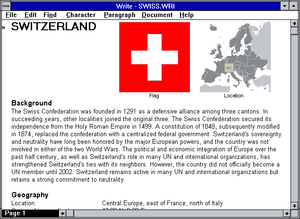 Early versions of Write only worked with Write (.wri) files, but with the modernization of Microsoft Word for Windows in 1989, and the introduction of Windows 3.0 the following year, Write became capable of reading and write early Word (.doc) documents. With Windows 3.1, Write became OLE capable. Windows Write is similar to the modern WordPad, which was introduced in Windows 95, and like WordPad, Write was more advanced than Notepad and was considered a modern word processor. However, Write did not have the many features of software such as Microsoft Word. Write has some features that WordPad lacks, notably justification of text. As its default program icon was a pen having just finished writing a capital letter A, the program was referred to by some users as 'A-Write'. In Windows 98 and later versions of Windows, the Windows Write executable (write.exe) simply executes WordPad. The Microsoft Write software seems to be old or discontinued. If you need more information please contact the developers of Microsoft Write (Microsoft Corporation), or check out their product website.